One of the benefits of reupholstery can be making changes to the “little things” that may have been bothering you for years. The perfect time to identify these problems is at start of the project so you can plan to correct them. be sure to check out our measuring and templating tips before taking on those parts of the project. If moisture buildup is a major concern for your project, be sure to check out our outdoor foam Quickdri. This style of foam allows moisture to pass directly through it, solving any moisture buildup concerns during use and storage. Many RVs and boats use custom-sized mattresses which often customers believe to be a standard size – a queen or a double – only to find out it’s different than expected. These beds are often custom made to the unit, in order to fit the design or safe space, so double check your measurements before committing to a size. Seat and back cushions will often fold down in order to become a bed. While this versatility is great, be sure to understand what this means for your foam. Typically, seat cushions are made from firmer foams while back cushions use a softer foam. In order to create uniform sleeping support, be sure to pick the same firmness for both seat and back cushions. For more details on foam firmness, check out our variety of foam types. Most boat cushions (and some rare models of RV cushions), need to be beveled to the angle of the wall. Plan for these beveled edges when thinking about reversible, or stationary style cushions. 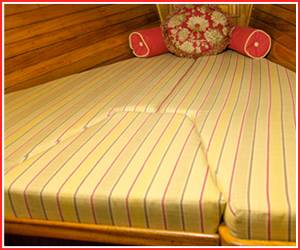 When measuring beveled cushions, for a boat, have the cushions rest approximately 1/2 inch away from the beveled wall in order to prevent condensation buildup between the foam and hull. cushions indoors, in a temperature-controlled environment because both too much heat, and too little heat, can cause moisture buildup in your cushions. If you find yourself needing answers to questions for your RV or boat reupholstery project, stop by and get direction and advice from our helpful staff at a convenient location near you.